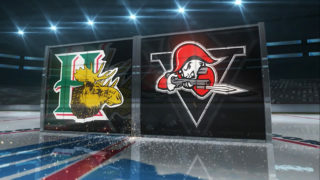 The Halifax Mooseheads feel they have the right person in place to guide the team to it’s second Memorial Cup championship of the decade after Thursday’s hiring of Head Coach Eric Veilleux who signed a three-year contract. He comes to Halifax with a remarkable resume and a proven track record. The 2012 Memorial Cup champion and 2013-14 CHL Coach of the Year is 14th all-time in wins by a QMJHL Head Coach with 346. That experience bodes well for the franchise which will be hosting the 101st Memorial Cup just over one year from now. 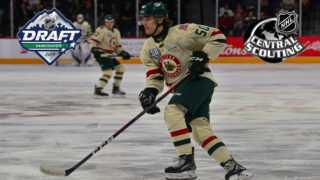 “I couldn’t be more excited to soon be working with someone who has as much experience as he (Veilleux) does at the pro and junior level,” said Mooseheads forward Benoit-Olivier Groulx. 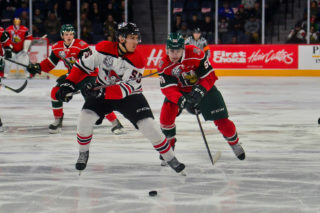 Groulx and the rest of the young core of the Mooseheads made great strides this past season and the Herd finished fourth overall in the league with 93 points. 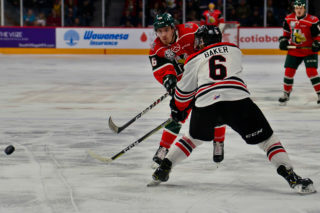 Halifax exited the playoffs a bit earlier than they had hoped after being swept in the second round by Charlottetown. Maybe the biggest knock on the developing team was that they weren’t able to bear down defensively at key times. Veilleux vows to make some changes upon arrival. “One thing that is not going to change about me is that our team is going to work hard,” he said. The coach inherits a team loaded with talent including three players ranked in the first round of this June’s NHL Entry Draft in Filip Zadina, Jared McIsaac and Benoit-Olivier Groulx. Goaltender Alex Gravel is also pegged to be drafted next month and could be the beneficiary of some improved defensive play in front of him if Veilleux implements those same systems in Halifax that he ran in Baie-Comeau and Shawinigan. 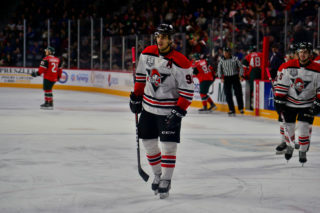 Veilleux’s teams twice won the QMJHL’s Ron Lebel Trophy as the club with the best goals against average and four times they finished in the top three in that category. “He knows what to do to make us win. It will be exciting to have him lead us since he won when Shawinigan hosted,” Gravel said. Although he likely won’t visit his new home until after June’s QMJHL Entry Draft, ironically being held in Shawinigan, the new Moose coach is already doing his homework on the team he has inherited. 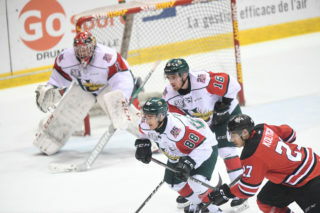 Jon Greenwood will return for his fifth season on the bench while Sylvain Favreau is back for his second year with the Mooseheads. Favreau, like Veilleux, got his start in the CCHL in Ontario and said he has admired his new colleague’s coaching ability for a long time. Fans will have their first chance to see the new coach go to work with his troops in mid-August when training camp opens at the Mooseheads practice facility at the Dartmouth 4-Pad. For now, the team can be pleased it has one major building block in place as it heads towards what will be one of the most important seasons in franchise history. Season Tickets are on sale now online at TicketAtlantic.com and in person at the Ticket Atlantic Box. 2018-19 Mooseheads Full Season Ticket holders will receive priority over the General Public as well as discounted pricing for 2019 Memorial Cup ticket packages.